In the summer of 1969, John Dawson was looking to showcase his songs while Jerry Garcia was looking to practice his brand new pedal steel guitar. The two played in coffeehouses and small clubs initially, and the music they made became the nucleus for a bandthe New Riders of the Purple Sage. One of the many gigs with the Dead included the Trans-Canadian Festival Express with Janis Joplin, The Band, and other American and Canadian artists like Ian and Sylvia, who had with them a brilliant, innovative pedal steel player named Buddy Cage. When Garcia's busy schedule made it increasingly difficult for him to play with the New Riders, the talented Cage was the perfect choice to fill the pedal steel spot. He moved from Toronto where he had been working in Anne Murray's band, to California in the fall of 1971 to join the New Riders. With the addition of Cage, the New Riders emerged as a fully independent unit. An excitingly creative band with a special brand of musicsweet country harmonies mixed with pulsing rock rhythms. The New Riders were signed to Columbia Records in 1971 by Clive Davis and their eponymous first album, New Riders of the Purple Sage, was released in September of that year to widespread acclaim. In December, 1971 they played a live radio broadcast with the Dead over WNEW-FM in New York to an audience of millions. In 1972 the pattern of their success continued to grow, with their first European tour followed in June by the release of their second album, Powerglide. 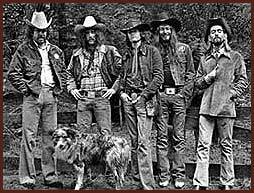 They toured the United States extensively in response to increasing demand, and in November, 1972 released their third album Gypsy Cowboy. These first three New Riders albums were all produced by Stephen Barncard, who also worked with Crosby, Stills and Nash and co-produced the Dead's American Beauty.